features product and contact information. manufactures big game fly rods, light tackle saltwater rods, bass fishing rods and three-piece traveler series with the patented hextek technology. manufacturers of fly rods, bamboo fly rods, spin fishing rods and bass casting rods. Nucor Vulcraft Group engineers and fabricates K-series, KCS-series, LH-series, DLH-series and SLH-series joists as well as joist girders, including special profiles such as single and double pitched, bowstring, arched chords, and scissor. custom build, repair, and refinishing of fishing rods including bamboo, fiberglass, and graphite, highlighting rods, components, and available services. rod builder makes all types of fishing rods from saltwater to ice fishing, ultra-light, spinning, casting and, of course, fly rods. custom designs and engravings available. custom fly fishing rods, saltwater rods, trolling and stand-up rods, fishing tackle, rod and reel repair, fff certified casting instructor and fishing guide, al crise. china. shirt interlining series, fashion garment interlining series, resin interlining series. per brandin split cane rods offer solid or hollowbuilt four strip rods or six strip rods. manufacturers of fishing rods, fly rods, reels, and float tubes. makes and sells hand-planed graphite and bamboo rods. usa. australian hand made fishing rods. custom fishing rods in northern california. makes hand-made split rods. usa. maker of a variety of rods using material such as graphite for trout and steelhead. usa. performance fly rods, using many brand name blanks. choice of components from various companies. manufacturer of several varieties of saltwater rods. includes product information and dealers. design, produces, and repairs rods made with graphite, composite, and fiberglass. usa. casting, spinning, saltwater, icefishing, and fly rods. features product information and dealers. maker of hand-planed split bamboo fly rods and blanks. rodmaking classes also available. makers of hand crafted split rods. photos and prices. usa. custom rods, blanks, and restoration. information about classes offered. on line catalog of graphite fishing rods. custom built, made to order inshore and offshore salt water fishing rods. specializing in spey/two-handed casting fly rods. features product information, components, and articles. makers of handmade rods using agate rings and nickel silver reel seat. ireland. forums and links for those that fish, collect, repair, and build bamboo and fiberglass fly rods. If the business hours of temple fork outfitters fly rods in may vary on holidays like Valentine’s Day, Washington’s Birthday, St. Patrick’s Day, Easter, Easter eve and Mother’s day. We display standard opening hours and price ranges in our profile site. We recommend to check out templeforkflyrods.com/ for further information. 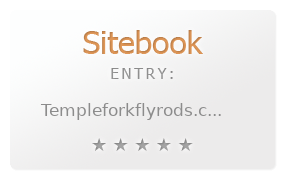 You can also search for Alternatives for templeforkflyrods.com/ on our Review Site Sitebook.org All trademarks are the property of their respective owners. If we should delete this entry, please send us a short E-Mail.